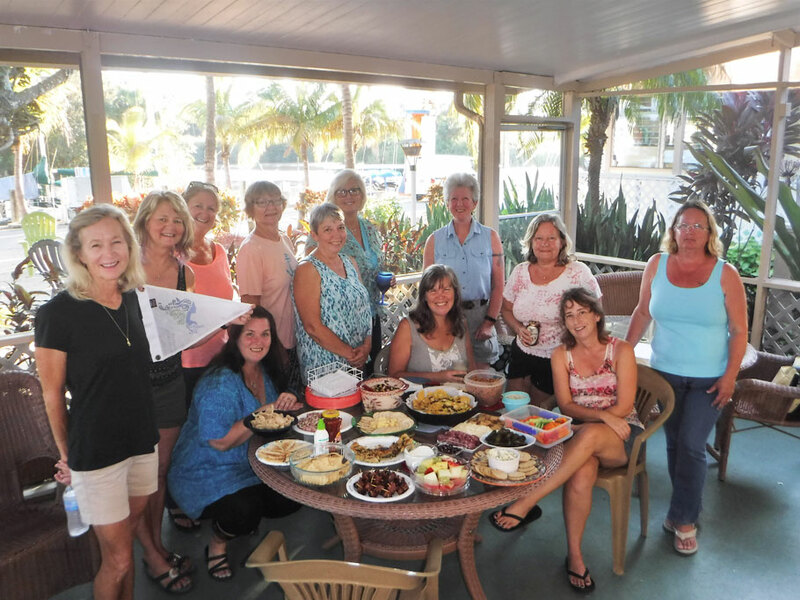 The Women Who Sail Facebook group meetup. This is one of my favorite groups on Facebook. 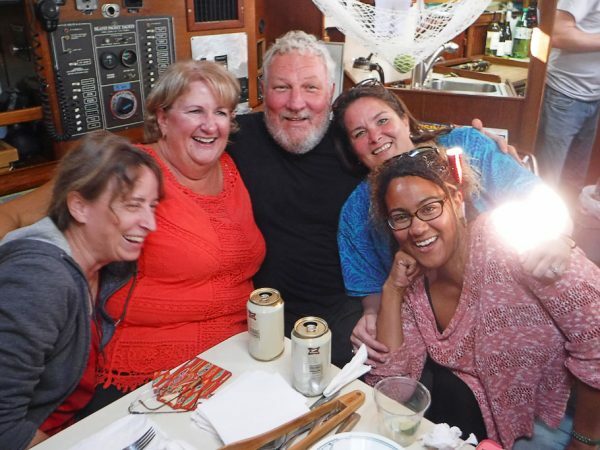 It has been great to be a part of it, but was especially great to be included in hanging out and socializing with some of these special sailing women in real life. “Moose balls!” kind of sounds like a mild expletive. Like something you would say if you broke a nail, spilled a glass of milk, or missed your exit ramp. I could say sailors use mild expletives like this all the time, but that is a lie, any expletive a sailor would use would be much larger than a moose ball. Moose balls are actually something wonderful that developed during our time at Indiantown Marina. It started at one of the holiday parties the marina threw for all the cruisers, when a few of us were planning a Women Who Sail Facebook group get-together for the day after Thanksgiving. I volunteered to make margaritas. Tina wanted to make Jello shooters. I told her, being a vegetarian, that I didn’t eat gelatin, but not to worry about me. 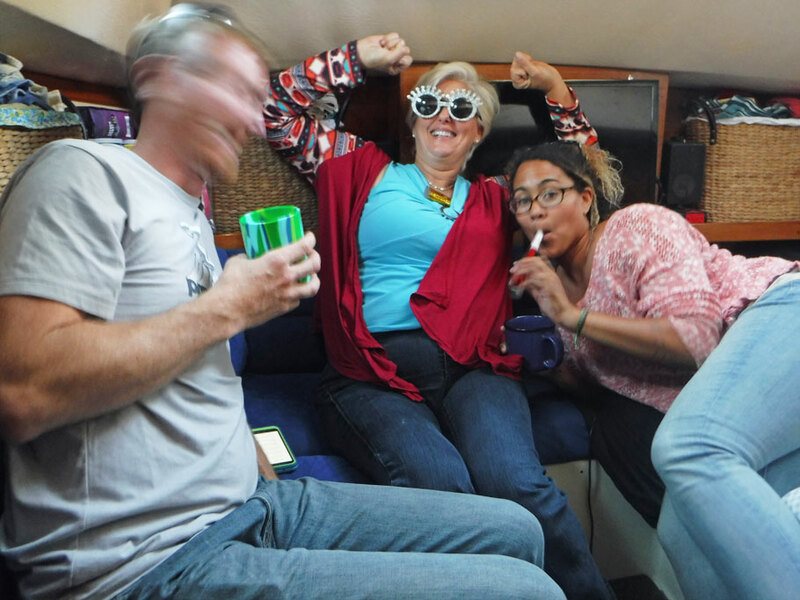 Except this is before I knew Tina that well and hadn’t realized that she leaves no partier behind – and that she loves a challenge. And rise to the challenge she did, showing up with chocolatey Baileys pudding shooters. They were amazing. A couple small dinner parties later Tina added a new ingredient to her shooter recipe – Cool Whip***. And just when no one thought Tina or her shooters couldn’t be any cooler, Tina’s shooters were transformed into a solid ice-creamy chocolatey alcoholic treat that begged to be named. So eventually, it only seemed fitting, these wonderful orbs of chocolate brown delight invented by a Canadian, came to be know as Moose Balls. 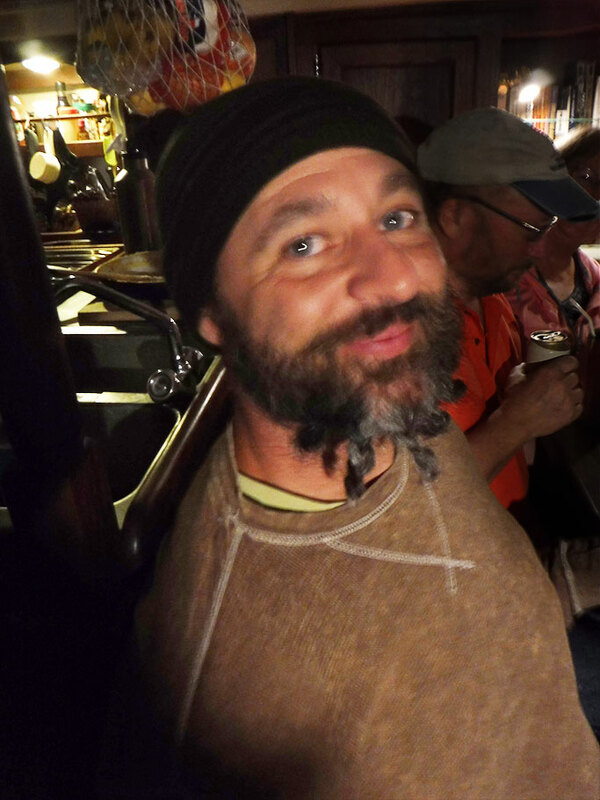 Moose Balls are actually kind of a metaphor for our social life at Indiantown – you know, how friendships develop and grow and turn into to something so good, you have to name them — like, say, The Indiantown Party Posse. The Indiantown Party Posse was/is actually a Facebook Messenger Group started to help plan the Women Who Sail meet up. The group quickly became a vehicle for planning small dinner parties and getting together for Taco Tuesday night at JR’s, a local bar and restaurant, to full blown parties and contests involving the whole marina. As it evolved this party planning turned into a fluid, free association bit of creativity, developing events on the fly from as little as a posted picture of a fish stew, which became a low country boil night, or a bad night at Taco Tuesday (not at JR’s), which became a fish taco night. I heard the Posse recently held a Spamageddon, a canned meat party and cook off (no doubt inspired by/in honor of the departure of the vegetarians from the Posse). 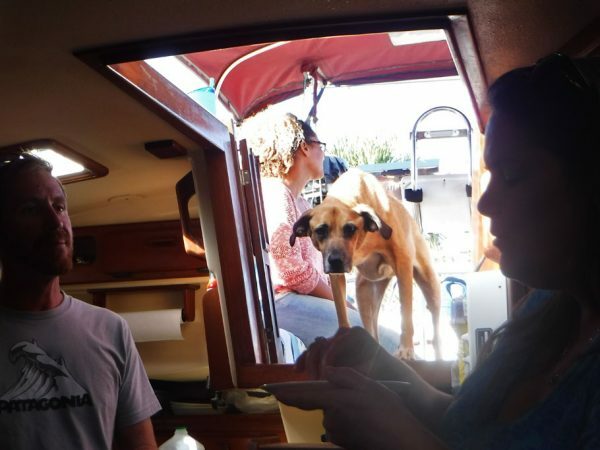 The best inspiration (in my opinion) the Posse conjured up during our time at the marina came from a conversation at a dinner party about seeing each other’s boats and discussion about what to do on New Years Eve. And The Indiantown Marina Party Posse Boat Crawl was born. 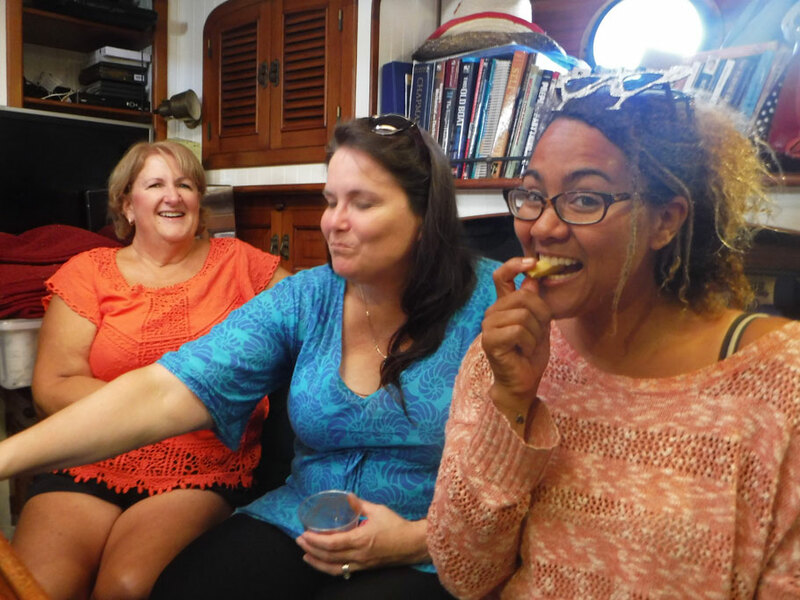 It was a progressive dinner (actually a progressive snack and drink), boat to boat from the storage yard to the docks in the marina. We toured 5 boats and one trailer, hung out with some of the best people in Indiantown, drank Baileys and coffee, Bloody Marys, Moscow Mules, Sangria, Champagne, and hot chocolate with peppermint schnapps, we ate pastries, fruit, egg bakes, garlic bread, stuffed mushrooms, chips and dip, antipasti, and nachos. And at the very end of it all, we danced and sang and downed a few cold creamy, chocolatey, friendship bonding shooters. Moose balls! Right now, this very minute, we are parked in front of a Lowes in Indio, California using their WiFi. We came up here to shop at all my favorite grocery stores, Aldi, Trader Joes, and my new favorite Mexican flavored supermarket, Cadenas (for those in Indiantown, think IGA the size of a Publix with cool latin music). We are still waiting for my packages from Amazon, working on the blog, and planning our next adventure (It is looking like it will be Mexico). *** Note – this blog entry has been altered to correct my mistake (not sure why my proof reader didn’t catch it) of mislabeling Cool Whip as Miracle Whip. The boat crawl started at noon at Tina and Doug’s boat a 1982 O’Day 37 named Amazed. 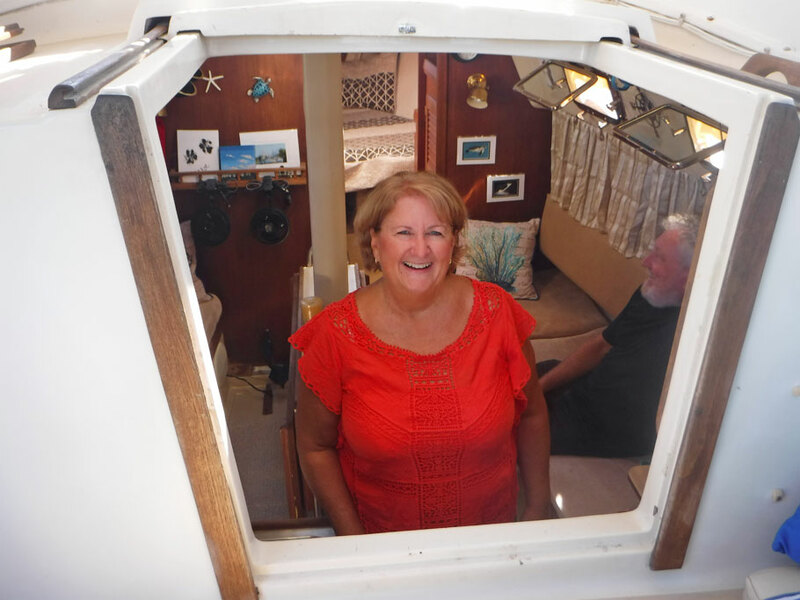 Tina explained how she was always amazed about her sailing life – which inspired name of the boat. In the cockpit of Amazed we enjoyed Baileys and Coffee and pastries stuffed with either cream cheese and strawberries or nutella and bananas. Besides eating and drinking everyone got to tour everyone else’s boat. Michelle stands in the cockpit of Amazed. You can see how cute Tina and Doug’s boat looks inside. What a fun couple, Ted and Sandy get into the New Years Eve spirit. Next stop on the tour was Ted and Sandy’s boat, Ragtime Gal, a 1988 Liberty Yacht Gatsby motorsailer. 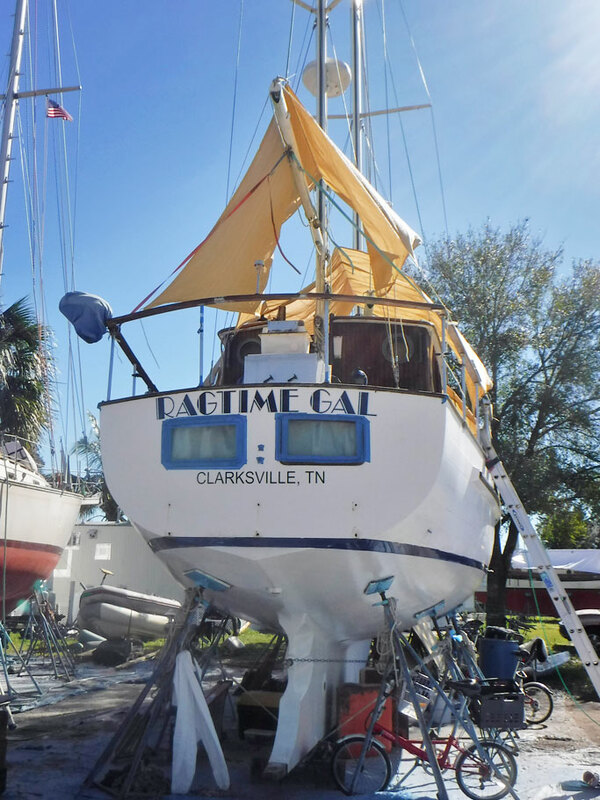 Ted and Sandy have been rehabbing her for some time – stripping her down to bare bones and rebuilding her inside and out. They are taking so much care, I am sure she is going to be absolutely gorgeous when she is done. Michelle, Tina, and Andrea in the Salon of Ragtime Gal. Sandy and Ted served up Bloody Mary’s and put out this amazing and creative spread of fruit, nutella, and homemade carmel sauce. They also served sausage and potato egg bakes. 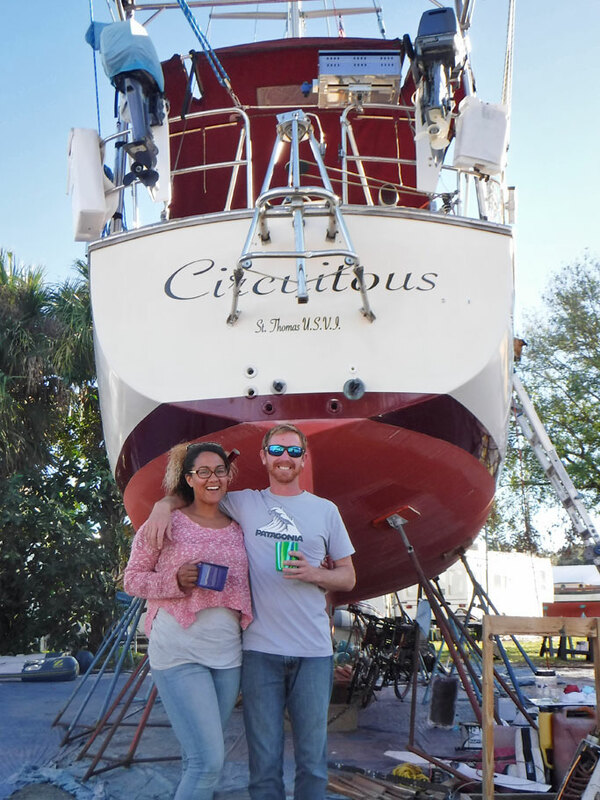 Next stop was Andrea and Scott’s boat, Circuitous, a 1987 Island Packet IP38. 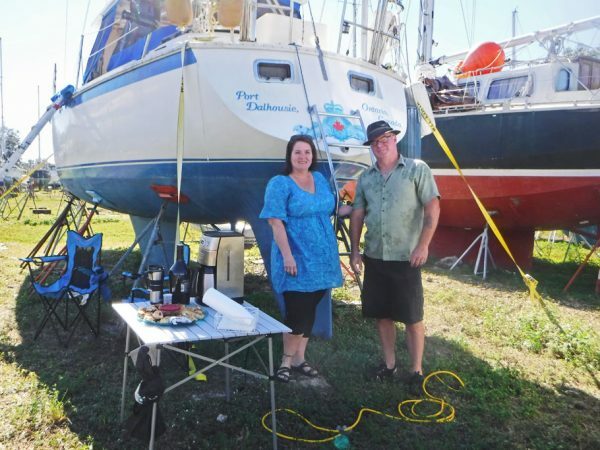 They are both deepsea divers and are currently cruising in the Bahamas. They were the youngest members of our little group and I think perhaps the envy of a few of us. 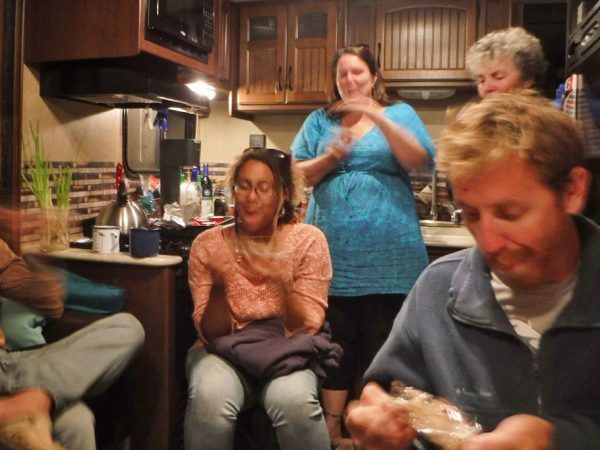 Andrea and Scott served Moscow Mules, garlic bread, and stuffed mushrooms. 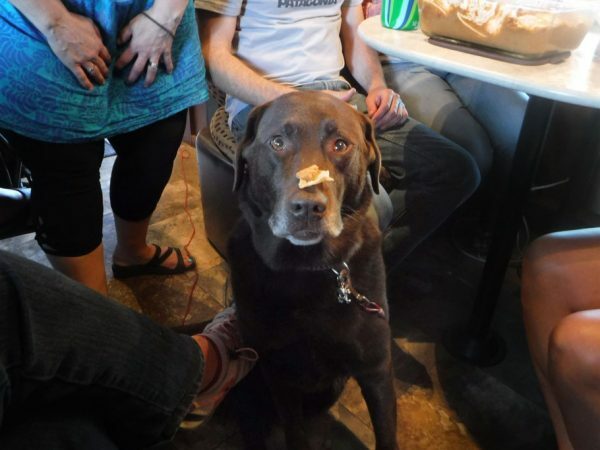 Here, Sandy (the dog) thinks she would like to partake in some of the goodies. 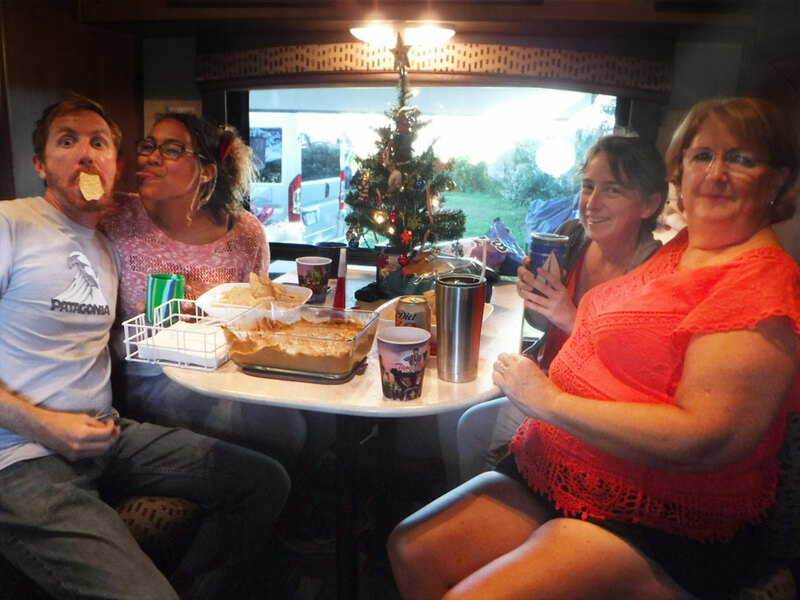 Ellen, Michell, Tina, and Andrea give Greg a little love. 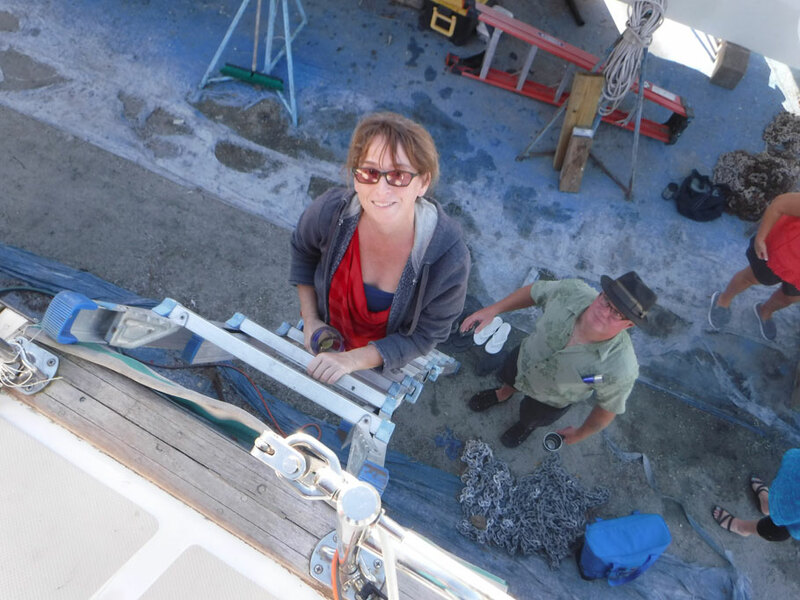 The frist three boats were on the hard either in the storage yard or work yard, so there was a lot of ladder climbing. This was by design, as we suspected motors skills may start suffering as the day progressed. 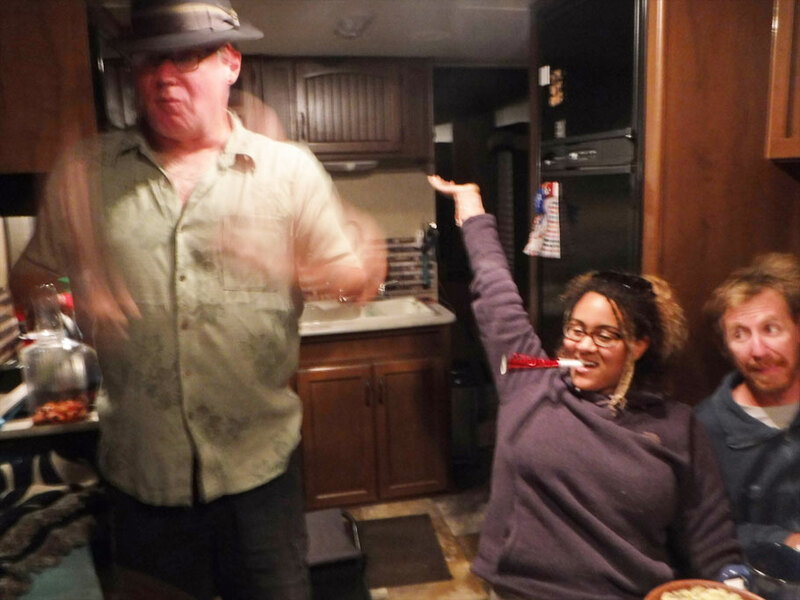 Forth stop was at Tina and Doug’s 2014 Jayhawk White Hawk Ultralight trailer. 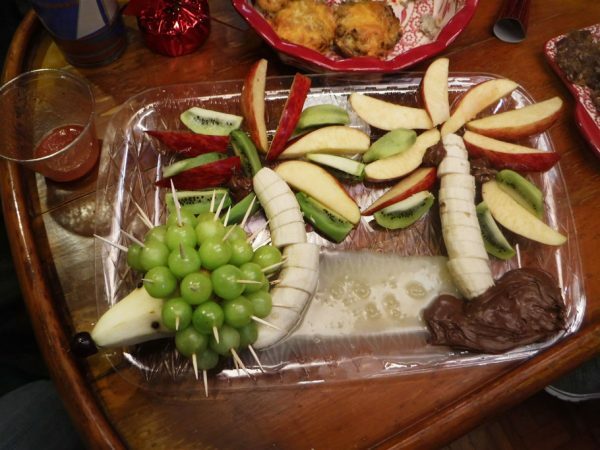 Tina’s amazing White Wine Sangria (with added vodka) and bean dip with chips were served. Things started to get a little silly. But Chloe was very serious, waiting for the magic word. Sometime while were on Circuitous Greg disappeared. I wasn’t too concerned, but everyone else was so I went to look for him. 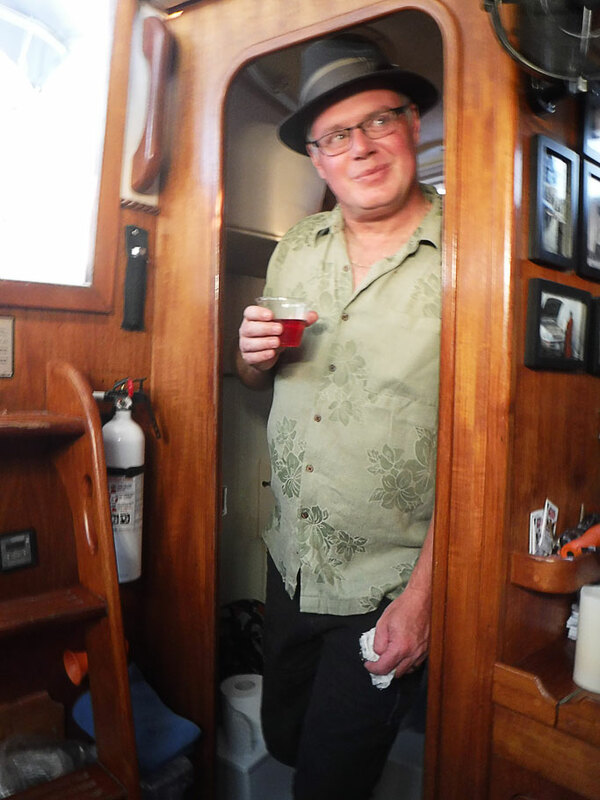 He had found a jam on the way back to our boat for beer (Amazingly Greg was the smart one that day and didn’t mix his liquors). 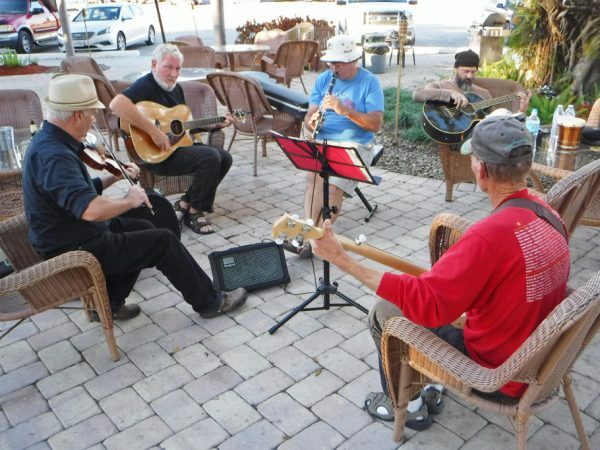 After I reported his whereabouts back at Tina and Doug’s trailer, Ted (on bass) also abandoned the party. And when I found Greg, I also found José. And José came back to the trailer. I think José knew everyone at the marina and it wasn’t unusual for her to drift from one party to the other. 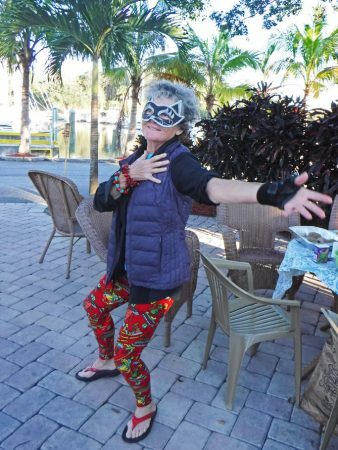 She was often the life of the party. Next stop was Ellen’s boat, Tickety Boo, a Moody 346, docked in the marina. 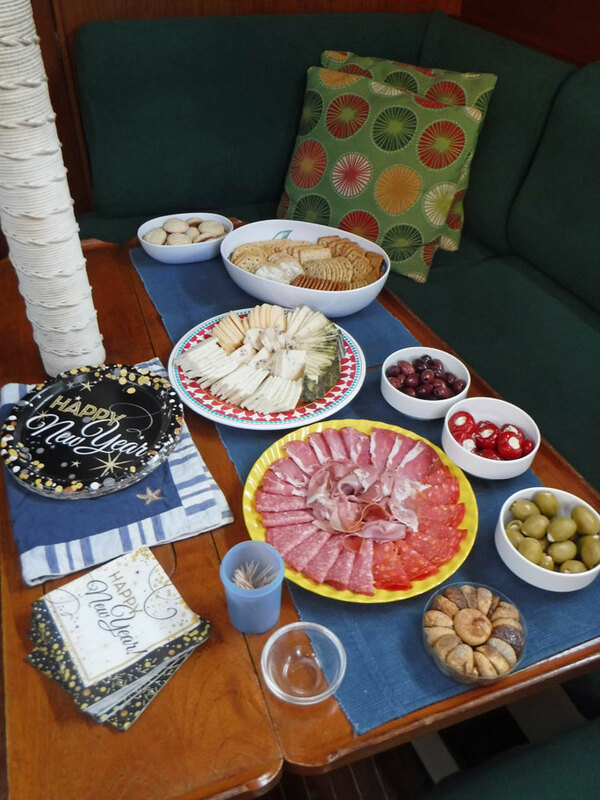 She served Champagne and an antipasti spread with meat cheese, olives, figs, stuffed peppers, and crackers. Tickety Boo was the smallest boat of our tour, and although it was able to accomodate everyone who boarded, Doug had to stand in the head (bathroom). And he looked darn good doing it, didn’t he? Scott, Sandy, and Andrea. Things started becoming so much fun I feared the gang would never make it to Blue Wing. 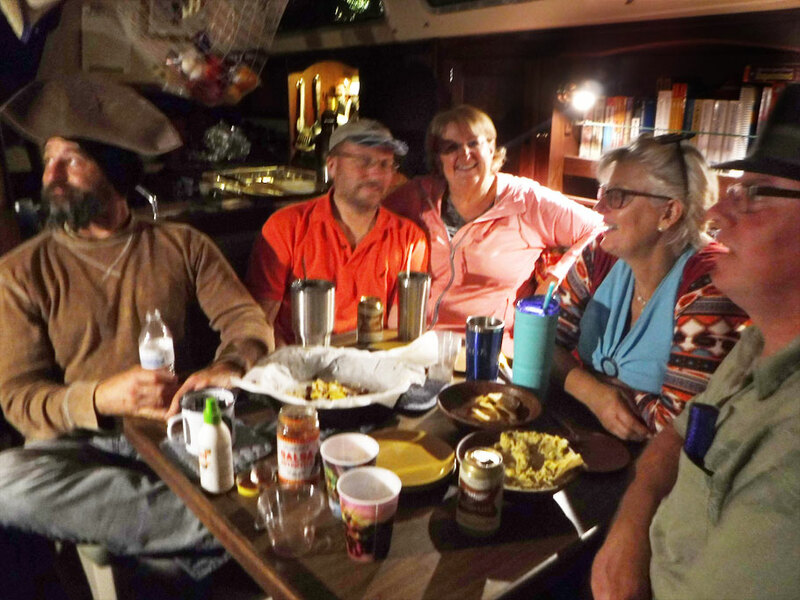 Finally, sixth stop – whew – everyone did make it to Blue Wing, our 1983 Catalina 36. We served hot chocolate with peppermint schnaps, nachos, and artichoke dip. Ted and Greg rejoined us. Someone suggests that Andrea braid Ted’s beard. 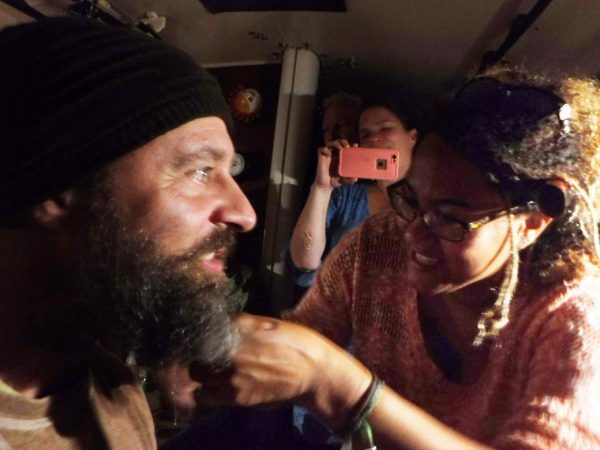 Apparently he has been growing it since he and Sandy started working on their boat, Ragtime Gal, and doesn’t plan to shave until the boat is finished – hopefully before he could qualify to play bass with ZZ Top. Ted sporting his new look. 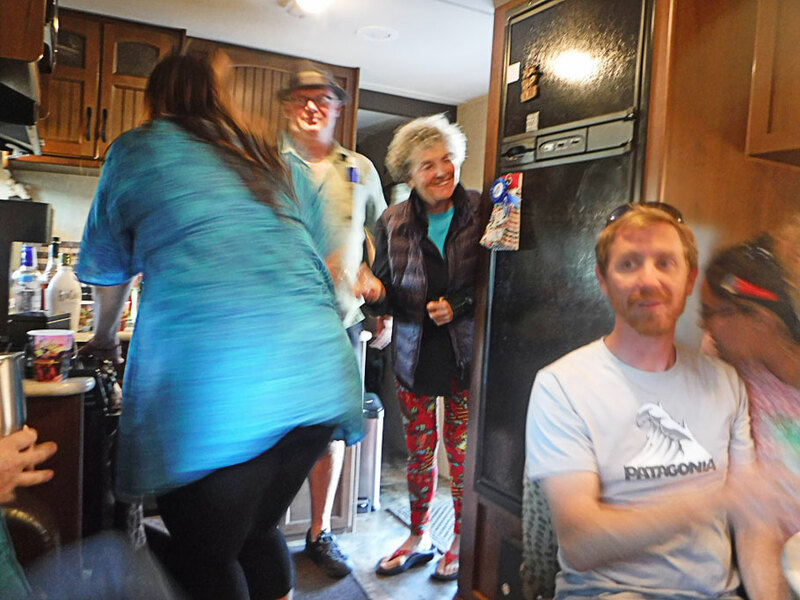 Blue Wing was supposed to be the end of the tour, but like many nights previous, the night wasn’t over until another visit was made to Tina and Doug’s trailor. I can’t believe I never took a picture of Tina’s famous Moose balls, but they usually disappeared before I thought to snap a shot – but here is a pic of the gang eating those wonderful, saran wrapped treats. The day ended (around 10 – well past cruiser’s midnight) with Cheap Trick’s “I Want You To Want Me” blasting from the radio. The gang (the few who were left), danced and sang along, half in spanish – Yo quiero, te quieras – and half in english. Happy New Year! 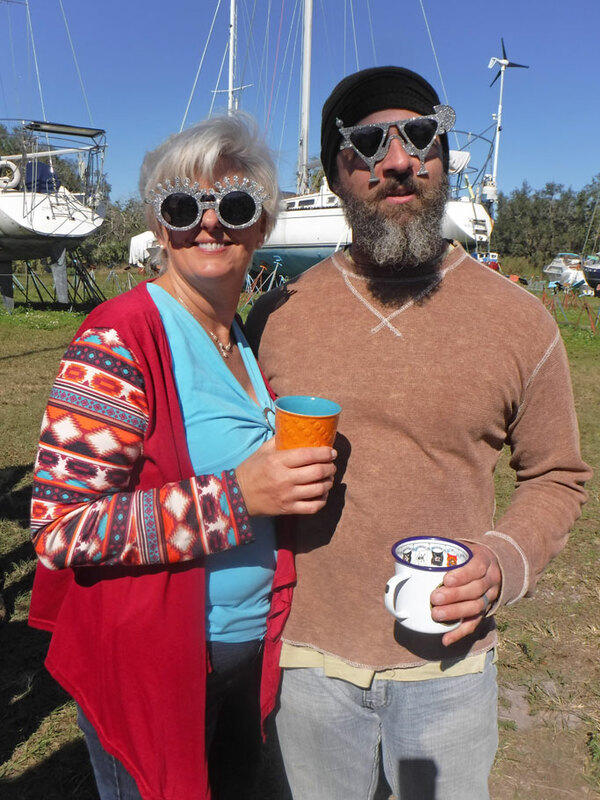 This entry was posted in Indiantown, Life on the Water and tagged Boat Crawl, Indiantown Marina, Moose balls, New Years Eve, Parties, Sailing Friends, Women Who Sail. Bookmark the permalink. Looks like one big Delta House experience. Great pics, lotsa fun. Thanks! Yeah – kinda was like those old college days. Soooo fun! We miss our musical vegetarians. Just an FYI the ingredient in Moose Balls that changed was Cool Whip not miracle whip. That would be a scary recipe. Never tried a shooter with mayo in it. Love your post and you guys. Find our cabbage town commune for us and I will make you all the Moose Balls you want. Ooops .. you are right, Cool Whip. I corrected the blog – I don’t want anyone to think you are making shooters with mayonnaise. We are still looking for the commune. Oh, the memories! So much fun was had. An unbelievable amount of fun! Hurry back so we can have that tofu cook-off. It was a blast! We are on for the tofu cook-off for May! Can’t wait to see what Tina comes up with.